Press Release: Suspect arrested for an attempted sexual assault of two juveniles on January 24, 2019. On Thursday, January 24, 2019, officers from the El Cerrito Police Department were dispatched to the area of Manila Avenue and the BART path on the report of an attempted kidnapping. Officers arrived on scene and learned two juveniles, ages eight and nine were walking along the BART path behind one of the girls’ father. While walking along the BART path adjacent to the DMV building, 42-year-old, Freddy Penate-Melara of Richmond approached the two girls. Penate-Melara grabbed one of the girls by the arm, but she was able to break free. Penate-Melara then grabbed the second girl, pinned her on the ground and began to choke her. 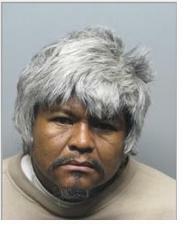 Penate-Melara then fled southbound on the BART path when the father was alerted to the incident. Moments after the call was received by dispatch, an ECPD officer located the Penate-Melara near the entrance to the DMV. Penate-Melara was positively identified by a witness and subsequently arrested.